Need a fun activity for your little ones as the Holiday’s draw near? Give your kids a chance to decorate their very own little Christmas tree with whatever they please. They can get creative and make the tree as fun and silly as they like! It is a great way to let your kids in on the holiday decorating. They will be so proud of what they have created. We are getting excited for the Holidays to arrive in our house! Our advent calendar has been keeping us busy with fun Christmas crafts and activities. 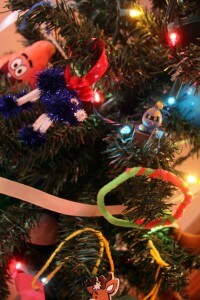 One of the kid’s very favorite activities this year has been decorating their own little Christmas tree. This was such an inexpensive project and they had so much fun with it. After Christmas a few years ago I found a fake 4 foot Christmas tree on clearance at Target. It was $17.00 full price, but was clearanced out at 80% off! So I grabbed the tree and paid less than $3.50 for it! Hard to beat, but I really didn’t have a purpose for it until now! So, I pulled the tree out and set it up in the hallway that leads to the kids rooms. I added lights and gave them the go ahead to get crazy and decorate. They were allowed to put anything on the tree that they wanted (with the exception of food and ornaments from our other tree). Oh my, they raced around the house, and loved stuffing their favorite toys and stuffed animals on the tree. 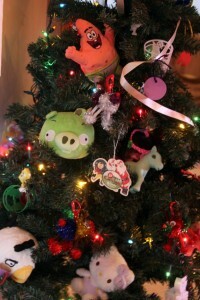 Pipe cleaners, cupcake toppers, my little pones, angry birds, clothes pins, ribbons, Sponge Bob and more. 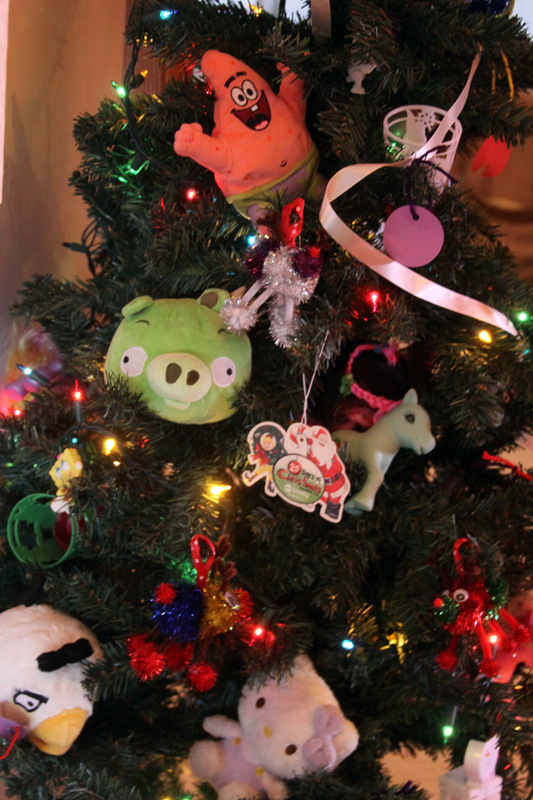 Everything from Mario to Hello Kitty is on that tree. So now they have a sweet little tree all lit up outside of their rooms to look at in anticipation of the big day! My favorite part about the tree has been adding their homemade projects to it as they days pass. Throughout the holiday season we have been making all kids of craft projects and my son has brought a lot of things home from school too. Where do you think the first place is that they want to hang them? On their tree. I love walking past the tree and seeing it covered in all of their holiday handy work, and festive creations. 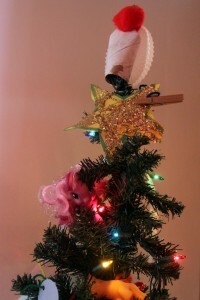 The tree is topped with a star covered in glitter and a toilet paper roll angel that he brought home from school. If I was four I guess I would want two toppers on my Christmas tree too! We made lots of cute little ornaments with Rudolph stickers to add to the tree, and the kids also made glittery little reindeer with sparkly poms that look just right ! This will for sure be a new tradition in our house and I can’t wait to see how things change throughout the years. I plan to take a picture each year and add it to a scrapbook to keep track of what they were interested in from year to year. This would be a great family activity at a holiday party or for Grandma’s house too – have each grandchild bring a handmade ornament. You could have everyone bring a little something to add, and have a little piece of each one of your family members on the tree to enjoy through the holidays.